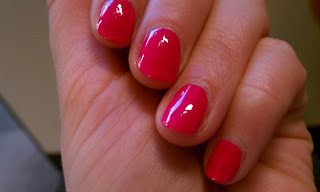 I really love a pinky-pink polish for summer, especially on toes. It can be hard to find a color that you can wear for several days though without becoming bored with it in this color range though (or at least that's what happens to me). 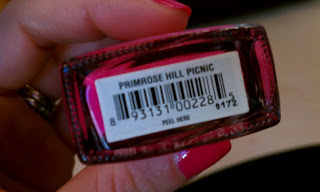 Butter LONDON's Primrose Hill Picnic is the perfect shade of fuchsia pink; it's not to dark, not to light, and it manages to look good with almost any colors you may be wearing. The lighting is not great here, but hopefully you can tell that this goes on slightly darker than it appears in the bottle. Every time I wear this people ask what I have on, especially when I use it on my feet and have a bit of a tan. I'm a huge fan of the shade variety of butter LONDON polishes - use a base and top coat though if you want them to last longer than a day or two without chipping. ps: there is also a new matching lip gloss available! 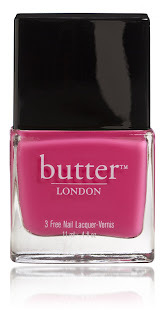 I have yet to hop on the Butter London bandwagon , does it chip that easily ? They do chip quickly Lauren. There colors are great, but for the price ($14-$18) the polish only lasts 2-3 days before it chips so I don't know that I'll purchase more.